I like puzzle games. I am grateful Family Friendly Gaming was given a digital download code for Pipe Push Paradise on the Nintendo Switch. There are forty-seven puzzles in this open world area where we walk around going into the areas to solve the puzzles. What kinds of puzzles are we solving in Pipe Push Paradise? We are connecting the pipes so the water will flow as it is supposed to. The indie graphics in Pipe Push Paradise greeted me immediately. I was a bit turned off. The music in Pipe Push Paradise is okay. Nothing that stuck with me, and nothing that annoyed me. So middle of the road there. The controls in Pipe Push Paradise are really touchy. Thankfully at the touch of a button we can undo the last move. We can keep pressing that button to go back farther. There were many levels in Pipe Push Paradise that I could see the solution. Enacting the solution was harder than I could have ever imagined. The puzzles in Pipe Push Paradise start hard and get worse as the game progresses. This is a 395 meg download. 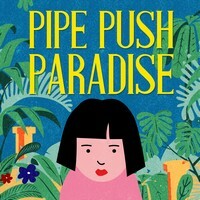 I am not aware of physical copy version of Pipe Push Paradise available for the millions of families in the physical copy movement. There are puzzles in Pipe Push Paradise that still puzzle me. I even let others look at those levels in Pipe Push Paradise and they were just as baffled. I did not find any kind of a hint system to help out the more casual gamers. If you are stuck in Pipe Push Paradise then you are stuck. Puzzles need to be solved to open the way to the next puzzles. Which is a shame when you think about it. There is a bit of a story in Pipe Push Paradise. We learn about it as we talk to different people along the way. How did these pipes get so messed up? Why are there things blocking us from fixing things at the source? The pipe flipping mechanic in Pipe Push Paradise is very frustrating to me. It would happen at the worst possible times for me. This is obvious part of the challenge of this hard puzzle video game.